Only 7 Days to go - Last weekend before the IRS Form 2290 Deadline! Only 7 Days to go – Last weekend before the IRS Form 2290 Deadline! The last weekend of the Tax Season has begun, Federal Heavy Highway Vehicle Use Tax form 2290 for Tax Year 2018 – 2019 is due by August 31st 2018. Which leaves us only with 7 days in hand including this weekend, today is in Fact the Last Saturday of the Tax Filing Season of 2018 – 2019. Though there are three different ways to File Federal Excise tax Form 2290, The IRS recommended method is to E-file the HVUT Form 2290. Since the other two options that is Mailing the form 2290 and walking into the IRS office to Paper file Form 2290 are time consuming, Truckers and Trucking Companies can write off those options as we have only 5 working days in hand. 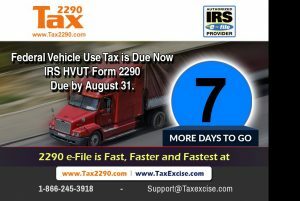 The Last five working days one can expect thousands of HVUT Form 2290 to be filed, hence act fast E-file Form 2290 right away by logging into www.Tax2290.com The First Ever & the ONLY DECADE OLD IRS Authorized E-file Service Provider to E-file Your Form 2290. You have assistance all the way through your filing process even on weekend. Call for support @ 1-866-245-3918 or write to support@taxexcise.com or chat with our tax Experts using the LIVE CHAT option on the Website. This entry was posted in 2290 e-file provider, 2290 for 2018, 2290 Mobile App, E-file 2290 Tax, Efile Now, file form 2290, Form 2290, form 2290 online, Heavy Vehicle Use Tax, HVUT For 2018 - 2019, Schedule-1 Copy, Tax Form 2290, Tax Year 2018 - 2019, Tax2290.com, Truck Tax Form 2290 and tagged 2290 Countdown, 2290 e-file, 2290 online, 2290 tax filing, 2290 truck tax, avoid penalties, efile 2290, Federal Heavy Vehicle Use Tax, Form 2290, Form 2290 E-file, form 2290 electronic filing, form 2290 online, Heavy highway Vehicle use tax, Heavy Vehicle Use Tax, Highway Vehicle Use Tax, how to file irs form 2290?, IRS Form 2290, IRS form 2290 e file, IRS Tax Form 2290, Last Few Days, tax 2290 electronic filing, Truck Tax Form 2290, what is form 2290 on August 25, 2018 by Tax Expert.